In comments submitted on 6 November to the U.S. House Natural Resources Committee, IADC affirmed its support for H.R. 4239, the Strengthening the Economy with Critical Untapped Resources to Expand American Energy Act (SECURE Act). Seven other oil and gas industry associations joined in on the letter to urge Chairman Bishop and Ranking Member Grijalva to swiftly enact the legislation. The comments, signed by IADC, along with the National Offshore Industries Association, American Exploration and Production Council, American Petroleum Institute, Independent Petroleum Association of America, U.S. Oil and Gas Association, International Association of Geophysical Contractors, Petroleum Equipment & Services Association, can be found on IADC’s Advocacy Website. The U.S. House passed a dozen bills in November, including the 21st Century Flood Reform Act (flood insurance), the National Defense Reauthorization Act and most likely of note, the Tax Cuts and Jobs Act (tax reform). The U.S. Senate confirmed over a dozen nominations in November, but did not pass any legislation. It is expected to pass its version of tax reform by the end of the month. Once the Senate passes its tax reform bill, a conference committee will convene to address the differences between the House and Senate passed tax measures. One particular item of note, the Senate Energy and Natural Resources Committee passed out of committee a provision to open ANWR as a $1 billion revenue raising measure to help pay for tax reform legislation. The President issued a few proclamations for November, but did not issue any new Executive Orders. The IADC Board of Directors elected Steven Brady, Senior VP – Eastern Hemisphere of Ensco, as its 2018 Chairman on 9 November. In addition, Kevin Neveu, President and CEO of Precision Drilling, was elected as Vice Chairman. Scott McReaken, CEO and Director of Sevan Drilling, was reelected as Secretary/Treasurer. For the IADC Division posts, Terry Bonno, Senior VP Industry and Community Relations for Transocean, will serve as VP of the Offshore Division. Mike Garvin, Senior VP of Operations Support at Patterson-UTI Drilling Company, will continue to serve as VP of the North America Onshore Division, while James Thorn, Chief Commercial Officer with Egyptian Drilling Company, was elected as VP of the International Onshore Division. For the Drilling Services Division, Lee Womble, VP Sales – Drilling Systems with Cameron, a Schlumberger company, will lead as VP. Mr Brady joined Ensco in 2002 and was appointed to his current position of Senior Vice President – Eastern Hemisphere in December 2014. Prior to his current position, Mr Brady served as Senior Vice President – Western Hemisphere, Vice President – Europe and Mediterranean, General Manager – Middle East and Asia Pacific, and in other leadership positions in the Eastern Hemisphere. Prior to joining Ensco, Mr Brady spent 18 years in various technical and managerial roles for ConocoPhillips in locations around the world. He holds a Bachelor of Science Degree in Petroleum Engineering from Mississippi State University. During the IADC Annual General Meeting in Austin, Texas on 10 November, IADC presented Dr. Thomas Burke, President and CEO of Rowan Companies, with the 2017 IADC Contractor of the Year Award. The award is presented annually to recognize an individual drilling contractor’s outstanding lifetime achievements in technical innovation, safety and economic efficiency within the drilling industry. Sponsored by National Oilwell Varco, the award, now in it’s 30th year, is the only one in the industry reserved solely for drilling contractors. Dr. Burke was appointed CEO and elected a director of Rowan Companies in April 2014. He served as Chief Operating Officer beginning in July 2011 and was appointed President in March 2013. He first joined the Company in December 2009, serving as CEO and President of LeTourneau Technologies until the sale of LeTourneau in June 2011. From 2006 to 2009, Dr. Burke was a Division President at Complete Production Services, an oilfield services company, and from 2004 to 2006, served as its Vice President for Corporate Development. In addition, he has been active in IADC for several years, serving as the association’s Chairman in 2016. The 27th Oil and Gas Survey conducted by the Aberdeen and Grampian Chamber of Commerce in partnership with the Fraser Allander Institute and KPMG was recently made available. Among other findings, the report found that 49% of contractors surveyed are more optimistic about their activities in the current year, up from 38% since the spring survey. A majority of respondents, 60%, believe that the bottom has been reached on the current cycle, up from 52% in the spring survey and from the 29% who believed the same a year ago. The full report can be accessed via the Aberdeen & Grampian Chamber of Commerce website. The U.S. Bureau of Labor Statistics (BLS) recently issued its Employer-Reported Workplace Injuries and Illnesses – 2016 report. It is the first in a series of two from BLS covering occupational safety and health statistics for the 2016 calendar year. In December, the BLS will provide data from the Census of Fatal Occupational Injuries (CFOI) of all fatal work injuries occurring in the U.S. during the calendar year. The CFOI uses diverse state, federal and independent data sources to identify, verify, and describe fatal work injuries to ensure that counts are as complete and accurate as possible. The BLS claims that all statements of comparison made within the report were found to be statistically significant at the 95% confidence level. Also according to the BLS, finance and insurance was the only industry secotr in which the TRC rate increased in 2016. For more information and to access the report, please visit the BLS website. On 5 December America’s natural gas and oil industry announced a landmark partnership to accelerate improvements to environmental performance in operations across the country. Focused initially on reducing methane and volatile organic compound (VOC) emissions, the Environmental Partnership includes 26 natural gas and oil producers, who produce a significant portion of American energy resources. Participating companies will begin implementing the voluntary program starting January 1, 2018. Collectively, at the time of launch, the participating companies represent operations in every major U.S. natural gas and oil basin. The Environmental Partnership is a historic agreement bringing together American natural gas and oil companies of all sizes to take action, learn and collaborate in an effort to further improve our environmental performance. The Environmental Partnership’s first initiative is focused on furthering action to reduce air emissions, including methane and volatile organic compounds, associated with natural gas and oil production. To accomplish this, the Environmental Partnership has developed three separate Environmental Performance Programs for participating companies to implement and phase into their operations starting January 1, 2018. Leak Program for Natural Gas and Oil Production Sources: Participants will implement monitoring and timely repair of fugitive emissions at selected sites utilizing detection methods and technologies such as Method 21 or Optical Gas Imaging cameras. Program to Replace, Remove or Retrofit High-Bleed Pneumatic Controllers: Participants will replace, remove or retrofit high-bleed pneumatic controllers with low-or zero-emitting devices. Program for Manual Liquids Unloading for Natural Gas Production Sources: Participants will minimize emissions associated with the removal of liquids that, as a well ages, can build up and restrict natural gas flow. In addition to its programs, the Environmental Partnership will provide a platform for industry to collaborate with stakeholders and learn from one another. To view more information about the program and companies’ commitments, visit www.TheEnvironmentalPartnership.org. Brazil’s National Agency of Petroleum, Natural Gas and Biofuels (ANP) announced on 1 December the areas for exploration and production of oil and natural gas available on a permanent basis. 846 blocks of 13 sedimentary basins, totaling approximately 285,400 km and 15 areas with marginal accumulations in three basins are available. The areas selected by the ANP still depend on the evaluation of the competent environmental agencies. By the end of April 2018, the ANP will disclose the rules for pariticpation and the technical and economic parameters of the areas in permanent supply, when the bidding process will be started on an ongoing basis. Bid submission sessions will take place in November 2018. The opening of the permanent supply process represents another important step forward in resumption of exploration and production of oil and natural gas in Brazil. For the full announcement, please visit ANP’s website. Norway’s Petroleum Safety Authority recently issued a notice that the Norwegian language should be the working language for operations in Norway. The notice points to the “Risk Level in Norwegian Petroleum Activities” report, which shows that nearly 40% of offshore employees who responded to the questionnaire in 2015 fully or partly agreed that dangerous situations arise due to the fact that not everyone speaks the same language. Section 14 of the Framework Regulations requires that Norwegian languages should be used to the greatest extent possible, and specific concerns have been expressed that English is replacing Norwegian as the working language in Norway’s petroleum industry. The full letter, in Norwegian, can be accessed via the PSA website. Competence Assurance is a crucial part of the employee development process. Having competent employees helps to assure the safety of employees, assets, and the environment. These are some of the reasons the industry worked collaboratively to develop IADC’s Competence Assurance Accreditation and Guidelines for Building a Competence Program. IADC and industry understand and embrace the need for continual improvement in an ever-changing industry and are working on making the Competence Accreditation better. The Accreditation Division is currently working with industry and IADC Competence SME auditors to grow the program and include new industry best practices. Working together to share strengths from the various programs will help raise the bar on competence across the industry. The new accreditation handbook with enhanced requirements is anticipated to be released in Q1 2018. For more information about the Competence Assurance program, please visit the IADC Accreditation website. For questions, please contact Brooke Polk at Brooke.Polk@iadc.org. The online exam for IADC’s well control training and assessment program, WellSharp, is now available in Arabic. The Arabic translation is now available to all training providers. The exam was previously translated into Portuguese and Spanish, and it will also be available in Mandarin later this year. The IADC HSE Committee is seeking nominations for an individual or individuals to serve as chairman or co-chairman of the Committee for 2018. The co-chair option is typically split between an onshore and offshore contractor. Any officer role in this committee must be filled by a drilling contractor representation. Presentations from the Q4 IADC Drilling Engineering Technology Forum “Extreme Drilling” are now available on line. The even was hosted by Baker Hughes, a GE company, on 15 November. Click here to view and download the presentations. Mission: Pilot your rocketship through a 3D home. Identify all products manufactured from petroleum. Then blast off into space! Mission Petrohouse is the latest interactive addition to DrillingMatters.org, IADC’s educational tool to dispel myths and misconceptions about the petroleum industry. In this exciting 3D game, developed specifically for IADC Drilling Matters, the player pilots a retro-style rocket ship through an ordinary home. The goal is to identify and “zap” all objects derived from petroleum to fill the ship’s fuel tank. The player’s “inventory” tracks all items zapped, and explains the connection to hydrocarbons. Easy to play on an ordinary computer. More than a Fuel: From the food we eat, to the clothes on our backs, to cosmetics and skin care products, soaps and detergents, life-saving medical equipment and pharmaceuticals, building materials, toys and packaging materials, thousands of the products we use and depend on every day are made from hydrocarbons. Life on a Rig: It takes a lot of people to keep a drilling rig working 24 hours a day. Because rigs often drill in remote locations, the men and women who work on them spend weeks away from home, working long hours. However, their hard work is balanced with an abundance of time off, good salaries, and generous benefits. How Hydrocarbons Drive Jobs and the Economy: As the most abundant, affordable and reliable energy source, fueling most of the planet’s power and electricity needs, oil and gas hydrocarbons also provide value in another very significant way: Jobs. And those jobs are generated across countries in every region of the globe, creating a ripple effect that stimulates local economies. Energizing Transportation with Oil and Gas: Energizing transportation is one of the largest boons humanity has realized from hydrocarbons. Before oil and natural gas, travel was a peril-fraught endeavor — dangerous, uncomfortable, and tediously long. Interactive Rig: Drilling Matter’s enhanced interactive rig produces narrated video when a user clicks on any of several rig components. Glossary: A handy guide to common and useful drilling terms. The Challenge and Rewards in Deepwater: Offshore production began in the US in 1896 in the Pacific Ocean offshore California. Modern offshore drilling and production uses equipment and techniques that are as far from those Nineteenth Century platforms as the International Space Station is from the Wright Brothers’ Kitty Hawk airplane. Check out the Drilling Matters website, and tell your friends and neighbors. Help us educate the public about our great industry. Drilling Matters: Spread the word. 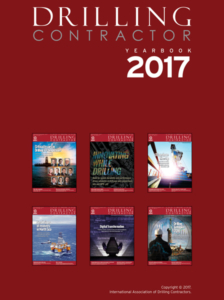 All issues of Drilling Contractor, IADC’s official magazine, for 2017 are now available as a single, easily downloadable eBook is now available from www.IADC.org/ebookstore. Drilling Contractor is the definitive source for the global drilling industry, both land and offshore, and the only viable magazine exclusively covering this space. The DC Yearbook 2017 presents every article, column, and advertisement published during the year. The easy to download eBook is convenient reading while traveling, on the go, or at the office. It’s a great way to reference and research technical articles, thought pieces by industry leaders, IADC initiatives, editorial, markets, and more. The Yearbook is bookmarked by each of the year’s six issues. Once the PDF is downloaded, no Internet connection is required to read the eBook. Downloading is a 2-3-minute process, and the eBook can be installed on up to six devices owned by the eBook purchaser. Click here to review and purchase the 2017 DC Yearbook. Tomorrow is here today, and the digital oilfield is already impacting drilling operations in ways good and bad. This virtual panel discussion, airing 9 January, 2018, will explore the risks and benefits that can accrue from these cutting-edge technologies. Cybersecurity is a major topic, not just for our industry, but for virtually anyone who touches the Internet. Siv Houmb, CEO of Secure-NOK, and Chair of the IADC ART Cybersecurity Subcommittee, will walk us though the real risk of a cyberattack on drilling assets, motivations behind possible attacks, regulatory initiatives, potential solutions, and more. While the bogeymen of cyber-villainy are real and insidious, the upside of digital technology holds great promise for improved efficiencies. One of the most promising is block chain, the technology behind the burgeoning global Internet currency bit coin. Andrew Bruce, CEO of Data Gumbo, will detail the potential for block chain in oil and gas, including smart contracts that can remove time, expense, and mistrust. This virtual panel discussion will air at 10.00 CST on Tuesday, 9 January 2018. IADC recently updated the International Regulatory and Standardization Activities Affecting the Offshore Oil and Gas Industry report. The report provides a reference on international regulatory and standards development activities of various organizations that have the potential to affect offshore oil and gas operations. The report can be accessed on the IADC Advocacy webpage. Questions regarding the report can be directed to Jim Rocco at Jim.Rocco@iadc.org. The IADC Lexicon (IADCLexicon.org) is a compendium of upstream-related terms, which, unlike conventional glossaries, are official definitions drawn from legislation, regulation and regulatory guidance, standards (global, national and regional), and IADC guidelines. Terms often have multiple definitions from different sources. Check out the new Random Term Generator. A drilling operation conducted for the purpose of straightening the original hole, bypassing junk, or correcting mechanical difficulties in the original hole. Parker Drilling Canada Co.: Hebernia (1).